Ecthyma Gangrenosum (EG) is a skin infection generally caused by the bacteremia named Pseudomonas aeruginosa. It is a form of Ecthyma which can occur due to a bacteremia infection in people from all age groups. It should not be confused with Contagious Ecthyma. Leaving this skin disorder untreated may even result in death of the patient. The main characteristic feature of EG is the presence of single to multiple round or oval lesions that range between one centimeter and fifteen centimeter in diameter. The lesions are surrounded by haloes of Erythema and are characterized by hemorrhagic pustules in the center that gradually turn into necrotic ulcers. An individual may have only one lesion or multiple lesions. Patients experience pain on the skin of the affected area where the lesions develop. 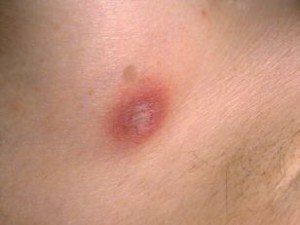 These lesions are painless in the beginning and gradually become painful blisters along with surrounding Erythema. The lesions may appear on any part of the body although they generally develop on the thighs, buttocks, legs, feet and ankles. At first, they are just pustules or vesicles over inflamed skin. The pustules deepen and ulcerate with the overlying crust. There is a shallow ulcer at the center of the wound. The ulcer has an indurated and raised margin. Performing a gram stain test of the fluid collected from the central blister can help to confirm the diagnosis. In cases where there is no fluid accumulation, a diagnostician may lift the scab and collect a swab from underneath. Two blood specimens are generally taken before starting the antibiotic therapy. The most favorable time to collect specimens is during temperature spike. A physician also performs a sensitivity study on any variety of isolated organisms. A diagnostician may collect a skin biopsy for a routine histology. Sometimes, special stains are also performed for ruling out the presence of other organisms which may lead to EG-like lesions. Usually, a doctor takes a second skin biopsy and sends it for tissue culture to detect any bacteria, yeasts, fungi and mycobacteria. Early diagnosis and immediate treatment with appropriate antibiotics is very important for treating EG. The antibiotic medicines are used to treat the underlying causes of the infection. In case the antimicrobials fail to treat them, surgery is used for removing the necrotic lesions. Surgical debridement may also be necessary for preventing the lesion from spreading any further. A physician should consider the presence of the Pseudomonal bacteremia as soon as EG is diagnosed. Early implementation of the antimicrobial agents is very important for preventing the condition from reaching a life-threatening stage. Pseudomonas septicemia is associated with a considerably high mortality rate. These medications may take a considerably long time to produce results. Due to this reason, it is recommended to use antipseudomonal penicillin or piperacillin (Pipracil) along with aminoglycoside or gentamicin (Garamycin). A physician may make further adjustment in the use of antibiotics once the sensitivity results of the patient become known. Systemic antifungal coverage is considered in case the doctor suspects a fungemia. The treatment should include coverage against Candida, Aspergillus and Mucor species using azole agents (such as fluconazole, voriconazole). In some cases, amphotericin B may also be used. Empiric antifungal and antimicrobial therapy must be comprehensive, covering all the pathogens that are likely to be responsible for the condition. Blood culture sensitivity test is important to determine which antibiotic is most suitable for a patient. Early and proper treatment makes it possible to have a positive outcome. Usually, patients having a single EG lesion can be treated more easily compared to those with multiple lesions. Treating the condition at an early stage allows the patient to have a long and healthy life. However, extremely advanced cases of EG may be fatal for an individual. Ecthyma Gangrenosum is a fairly rare skin disorder characterized by lesions on the affected part of the skin. This bacteremic infection can be treated with appropriate antibiotics and surgical procedures. It is possible to prevent this type of skin infection. One should maintain proper personal hygiene by changing clothes every day and wearing clean clothes. It is also very important to take daily bath using soap or at last clean oneself everyday to avoid this bacteremic infection. Here are some photos displaying how these contagious skin lesions look like.